Thank you to Cecil Curry for contributing the 1952 Thanksgiving Day football game program (Edison vs. Miami High in the Orange Bowl) from which the above image was taken. I played on the team that beat MHS in '64 9-0. I played on the Edison team that night. Herb Frith knocked the wind out of me on the opening kickoff. I was reaching out with my left arm and he ran right into it. I remember looking at his glassy eyes. Contacts? We knew we would win that night. No doubt in our minds. Bob, I hope the laughs were worth it at the time, haha. I would have forgone the laughing in exchange for the makeout session. I was dating a girl from Miami High at that time and took her to see the game( I went to Tech high)As you well know,Miami high lost that game to Edison,she cried crocodile tears and I couldnt stop laughin all night. "There was no making out that night"
As a MEHS graduate I remember this great rivalry . As a child I started attending this game every year. What memories. I believe it was 1952 that Edison first beat Miami High. Miami Jackson beat Miami High in 1951 and it was the first school to beat Miami High from the area. I believe it was 27 years before this happened. I went to this game and I thought that we (Edison High ) won it, the very next day I left town for the Air Force at San Antonia, Tx and always felt like it was a good send off for my exit out of south florida. I had a great time growing up in Miami. WOW!!! What a rivalry! 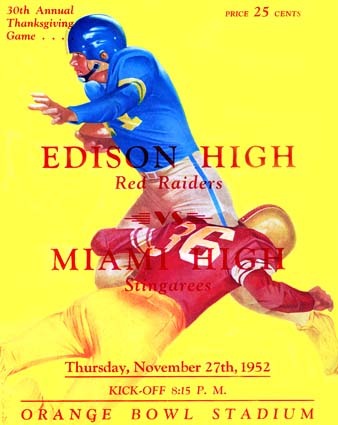 As an Edison alumnus (1957), I remember everyone looking forward to the Thanksgiving game between Edison and Miami High. Every year we hoped to beat them, but it rarely worked out that way. We did win the year before I arrived at Edison and the year after I left. Bad timing! Nevertheless, the stadium was packed with fans and I feel very fortunate to have experienced the thrill of the spectacle.